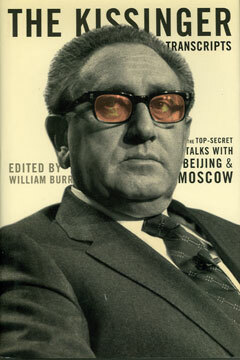 Considered “among the most important Cold War records to emerge thus far” by the former Beijing bureau chief of the New York Times, The Kissinger Transcripts gives us the unvarnished record of Henry Kissinger’s diplomacy during the Nixon years. Here are the transcripts, formerly classified “Top Secret/Sensitive,” of Kissinger's talks with Mao Zedong, Zhou Enlai, Deng Xiaoping, Leonid Brezhnev, Andrei Gromyko, and others. The Kissinger Transcripts lets readers make up their own minds about the most controversial Secretary of State in modern U.S. history. The National Security Archive is a nonprofit research library of declassified U.S. Government Documents in Washington, D.C. A project of the Fund for Peace, the Archive obtains and disseminates the U.S. government documents that are indispensable for informed public debate.